I like my MacBook Air (s aapl) because it’s thin and light, and can be packed in a bag or case without even really adding any extra weight, but there are times when that svelte frame is a liability rather than an asset. When thrown in a single-compartment backpack with heavy books or other gear, for instance. For those times, there’s the Blackbox case. 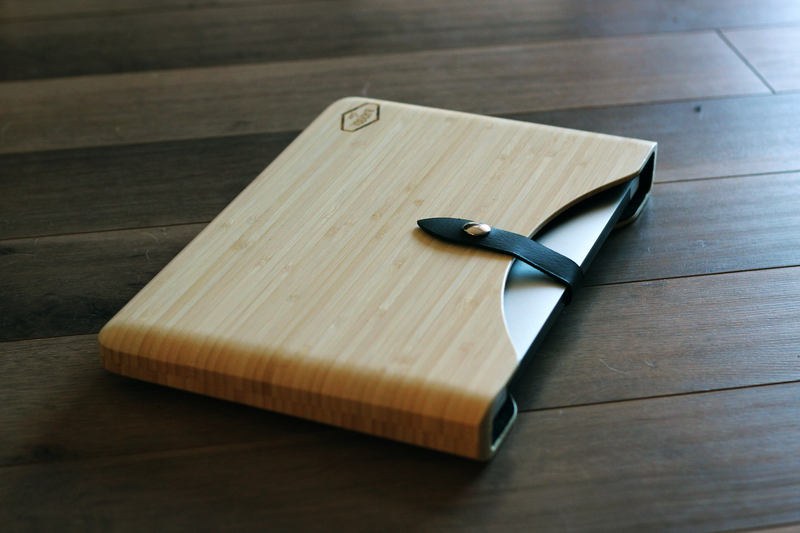 The Blackbox is a handmade case, currently available for iPad 2 and MacBook Pro. I got the chance to check out the upcoming MacBook Air version, and it’s a beauty in natural bamboo. The good looks owe as much to the craftsmanship as to the materials, as this is one clean-looking case with smooth lines that echo those of the MacBook Pro case created by Apple’s own industrial designers. The experience of having your MacBook Air in the Blackbox feels a little like nestling it inside a cutting board, and that’s a very good thing. Thanks to the leather strap, the corners of your computer are protected, and a snug, secure fit is guaranteed. The wood feels solid despite being hollow, and there seems to be almost an inch of coverage on the edges, making sure that there’s no weak connection points that will come apart or snap apart during a minor tumble. It also means you can stack plenty of weight on top of the case with your computer inside without worrying about hurting your Mac. Blackbox cases are treated with a water-resistant finish that helps enhance their good looks and also make sure that an accidental spill won’t fry your machine. I tested it out by dripping a bit of water on top and then wiping it clean; definitely looks like it’ll hold up to all but the most grievous of Starbucks incidents. Thanks to the weight resistance and a very snug fit, it should also stand up well to be tossed in a bag with other loose kit. Just make sure there’s nothing in there with edges that might scratch the exposed portion of your MacBook, as the top is open save for the strap. The one downside, especially if you’re using an Air mainly for its portability, is that this case does add considerable girth to your device. In fact, it more than doubles the height of the Air at its thickest point. But the Blackbox is surprisingly light despite its added bulk. On its site, Blackbox says that the existing versions only add around 1.5 lbs, and I’d say that’s about where the MacBook Air model is, too. It’s not heavy at all, considering how durable these things are. That’s how I’d best describe the Blackbox MacBook Air case. You won’t need it every time you need your Mac, but for adventurous outings, and times when bringing dedicated computer bags separate from your other luggage isn’t practical, the Blackbox is a rugged performer that’ll give you peace of mind when transporting your valuable, but fragile-feeling MacBook cargo. It isn’t yet available on the Blackbox site, but according to the Kickstarter site for the project it’ll retail for $109 when it arrives sometime soon.